Karimuga is a rakshasa, a pleasant rakshasa. He is a beautiful rakshasa too. But that makes all the other rakshasas jealous of him. Karimuga cant bear to see them unhappy. . . Sowmya Rajendran inverts our ideas about beauty, happiness and rakshasas with humour and a light touch. Nivedithas quirky pictures have little and big rakshasas romp through the pages in pinks and purples, blues and greens, adding to the fun. 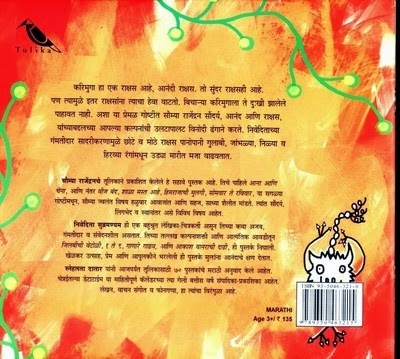 This is Sowmya Rajendran's sixth picture book published by Tulika. From Aana and Chena, her first, to Power Cut, School is Cool, The Snow Kings Daughter, and Monday to Sunday, Sowmya's stories evoke strong themes through a gentle voice and an effortlessly simple style. She has tackled subjects as varied as beauty, gender and displacement in her books. Niveditha Subramaniam is a versatile writer-illustrator who can write stories that are fantastical, funny and sensitive. Her busy imagination and passion for picture books have cooked up Jalebi Curls, 9 to 1, The Musical Donkey and The Skymonkeys Beard. Brimming with playful exuberance, warmth, and affection, they offer children many delightful moments.